What really happens when you place your laptop on your lap? Laptops are one of the most common productivity tools today. They’re portable, convenient, and powerful. 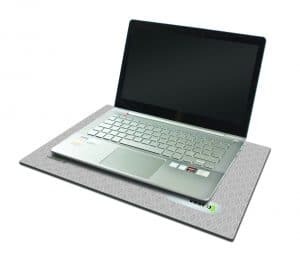 Contrary to its name, however, a laptop does not belong on your lap – unless you want to expose yourself to harmful electromagnetic frequency (EMF) radiation. Laptops emit EMFs in many different frequencies, and these EMFs can be extremely harmful to your health. Your vital organs also get an unhealthy dose of electromagnetic radiation from your laptop computer, if you make a habit of actually putting it on your lap. 1. It can harm your reproductive organs. A laptop may seem perfectly innocuous, but it receives wireless internet signals (microwaves) and radiates EMFs. Its proximity to your reproductive system can pose risks on a male user’s sperm count and a female’s egg release. Researchers in Argentina found that holding a laptop on the legs, near the testes, damages the DNA of sperm cells, suggesting the harmful nature of laptop radiation on male reproductive capacity. 2. It can lead to certain types of cancer. Swiss researchers, Drs. Andreas Arnold and Peter Itin from University Hospital Basel found that a hot laptop could lead to skin damage on your lap, and that might even develop into skin cancer. The claim was supported by dermatologist Anthony J. Mancini, who said that prolonged skin inflammation can potentially increase the chances of squamous cell skin cancer, which is more aggressive than the more common form of skin cancer. Since people hold laptops close to their reproductive organs, it can possibly cause testicular and ovarian cancers. 3. It can cause back and neck pain. A recent study found that hunching over that laptop on your lap can cause pain in the neck and back. Need a simple solution? Place the tablet on a table, in a case that holds it upright. When using a laptop or desktop, use a standing desk which has been found to be better for one’s posture. 4. It can cause sleeping problems. There might have been times when you’ve propped your laptop on your lap while relaxing and typing away in bed. The artificial light from screens that is now within eye-level, can suppress the release of melatonin, which helps you sleep. If you’ve been having insomnia for days, maybe it’s time to swap the laptop for a book before hitting the hay and hopefully those zzz’s will come a bit more easily. Alternatively, try f.lux – a Chrome extension that adjusts your screen’s brightness to the time of day. 5. It can lead to pregnancy issues. Prolonged laptop use can affect women’s fertility and ability to reproduce. It can delay egg production and can make it extra difficult for them to conceive. If they have successfully conceived yet continued to use the laptop on their laps or tummy, the EMF radiation can cause health issues on the fetus they’re carrying. When these babies are born, they may show signs of congenital and developmental problems. The Environmental & Occupational Health Publication found that mother and fetus are exposed to higher amounts of EMRs by laptops than those found in close proximity of high-voltage power lines or video screens. These pregnant women who use laptops in close contact with the body are at risk of detectable impairment to the health of their offspring. 6. It can burn your skin. If you spend vast amounts of time reading, studying or playing games on a laptop resting on your lap, you could develop “toasted skin syndrome.” A medical report has found that placing devices like laptops next to the skin for extended periods of time can lead to an unusual-looking mottled skin condition or rash caused by long-term heat exposure. This condition, also known as “erythema ab igne” develops over time depending on how much the laptop is used on the lap and how hot it usually gets. While the syndrome is generally harmless and resolves itself when further exposure is prevented, it can cause permanent skin coloration. In conclusion, these are quite compelling reasons to not place your laptop on your lap, especially when you’re connected to WiFi. Try to place it on a work desk or table to keep a safe distance between yourself and the device as much as possible.